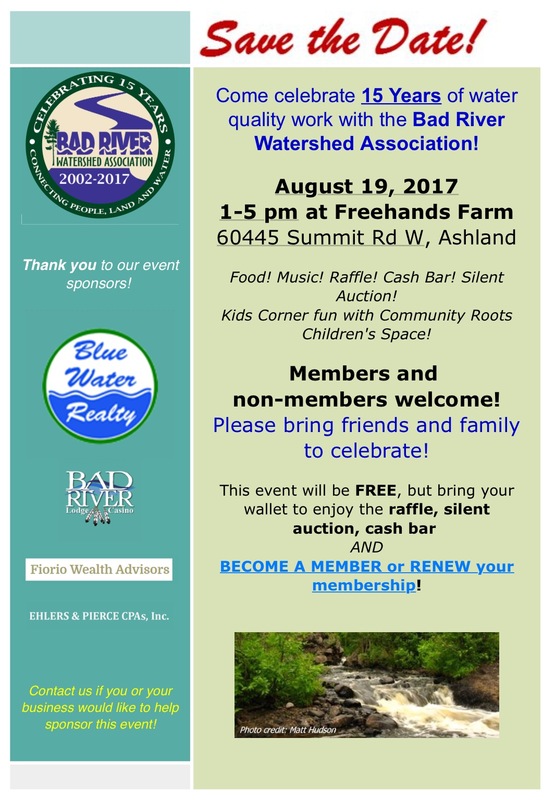 Started in 2002 by a group of local dedicated citizens, the Bad River Watershed Association was formed as a non-profit to promote a healthy relationship between the people and natural communities of the Bad River watershed by involving all citizens in assessing, maintaining and improving watershed integrity for future generations. The Bad River Watershed (BRW) drains over 1,000 square miles along Wisconsin’s north shore. The headwaters are found in the Chequamegon-Nicolet National Forest. The lower one-third of the watershed is land of the Bad River Band of Lake Superior Tribes of Chippewa Indians Reservation. Small, rural communities including Mellen, Odanah, Gurney, Mason, Grand View, Delta and Marengo are scattered throughout the watershed. The Kakagon Slough/Bad River Slough, located at the mouth of the watershed on Lake Superior, is the largest and possibly most pristine freshwater estuary remaining on Lake Superior and is the only remaining extensive coastal wild rice wetland in the Great Lakes Basin. The Bad River watershed is home to sturgeon spawning grounds, pristine coldwater trout streams, prime wolf habitat, and many more outstanding plant, fish and wildlife communities. Click to continue reading our full statement..
We have a new website to accompany our new name, Superior Rivers Watershed Association! Come check out the new site, superiorrivers.org, where future news and information will be posted! This marks our fifteenth year as an organization. In August, we hosted an event to celebrate this achievement and honor past and present volunteers and members. The event was held at Freehands Farm in Ashland, where we welcomed over 130 guests. It was wonderful to see so many familiar faces, as well as quite a few new ones. Past board members and founding members Dorothy Lagerroos and Laurence Wiland (recently appointed board president) spoke about their memories from the early days and founding of the Bad River Watershed Association. They described the impetus that led to the formation of the organization, which was a lack of recent water quality data in the Bad River watershed. Laurence acknowledged the foresight our founders had in identifying the importance of collecting baseline data, especially in the light of new proposed mining legislation, and the issues and proposed developments in our own local watersheds that have arisen since 2002. Laurence and our outgoing board president Sjana Schanning spoke about the expansion of our service area that was approved by the board in 2015 to include watersheds from Red Cliff to the Michigan state line. We needed a new name to reflect this broader geographical area, one that still captures the essence of our mission as an organization, which is to promote and protect clean water resources in Wisconsin’s Lake Superior basin. After long discussions with our board, stakeholders and founding members, we came up with several possibilities for a new name and we sent our members (many of you) a poll to see what you thought. We can’t understate how valuable your feedback was. The name we ultimately chose was not one from the list, but carefully crafted in large part from your comments and responses. 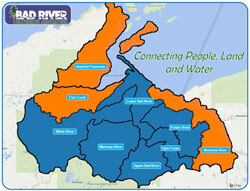 We have officially changed our name to… Superior Rivers Watershed Association! We are proud of our new name, and feel it represents the work we do, our local communities and their stewardship of the rivers we all treasure, and Lake Superior, where those rivers ultimately lead. Our heartfelt thanks to the community members who donated some very valuable and special items to our fundraising raffle and silent auction, which undeniably helped draw a big crowd. Thank you also to the following local businesses who sponsored the event: Blue Wave Foundation, Blue Water Realty, Heart Graphics, Fiorio Wealth Advisors, Farms Not Factories, Bad River Lodge & Casino, Thrivent Financial, and Ehlers & Pierce CPAs, Inc. Finally, thank you to everyone who helped make the past 15 years so great. Even if you couldn’t be there at our anniversary celebration, we were celebrating you. Thank you to our Citizen Scientists! Over the past month, despite the variable weather and flow conditions, 32 volunteers participated in our macroinvertebrate monitoring program! 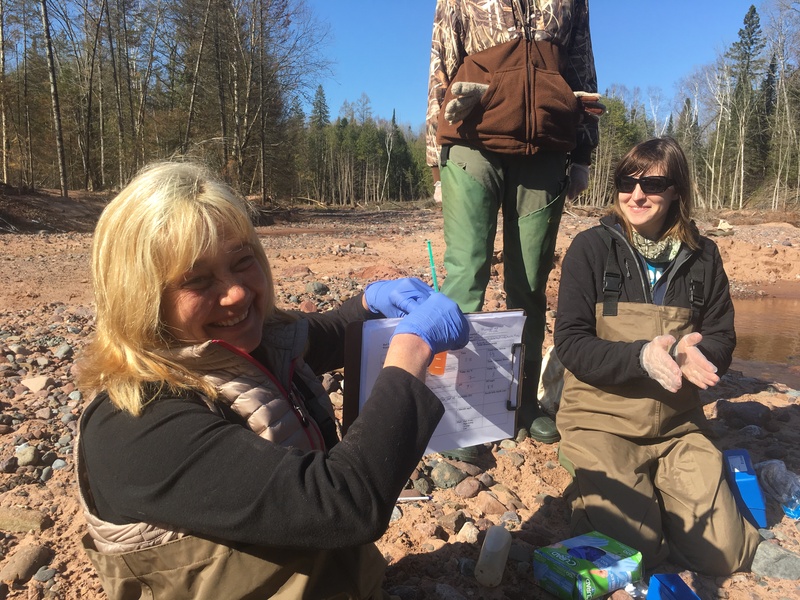 We have collected samples from 14 monitoring sites, six of which were in our recently expanded service area (outside the boundaries of the Bad River watershed). We hosted three group training sessions: at Whittlesey Creek National Wildlife Refuge, the Marengo River near a volunteer's home, and Kimball Falls in Kimball. 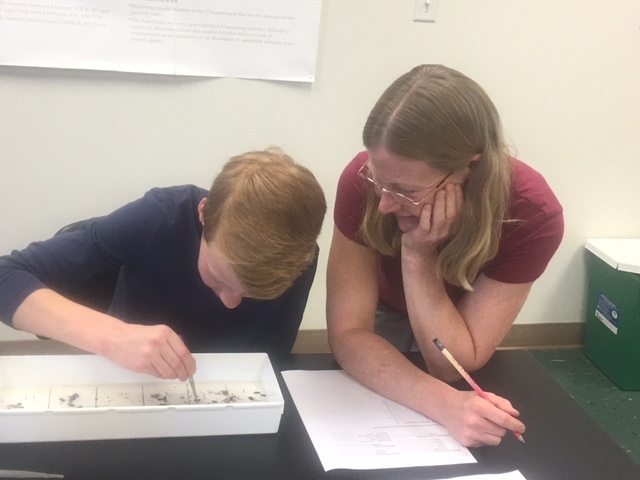 Two lab identification sessions were held at Northland College, where volunteers began sorting and identifying the macroinvertebrates in their samples. 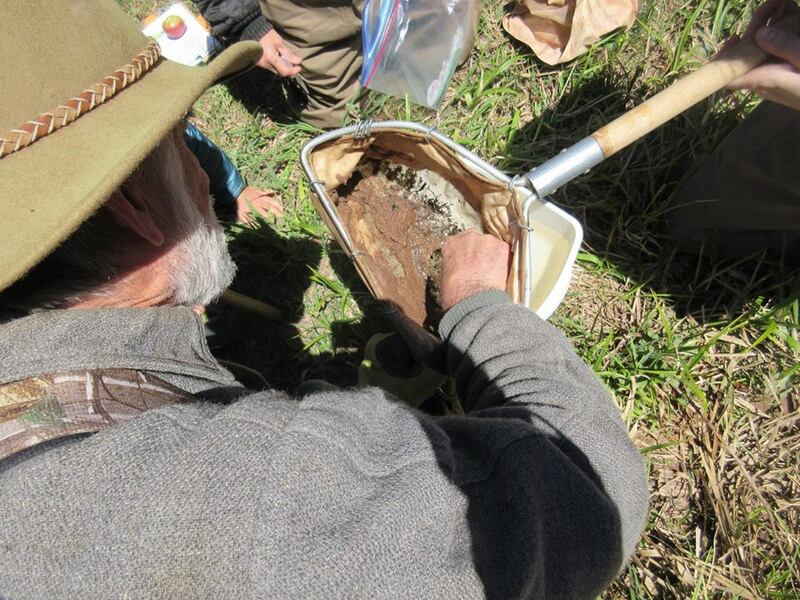 It was exciting to see the enthusiasm of new and returning volunteers to continue the collection of biological data (macroinvertebrates), a project that BRWA volunteers began in 2003. 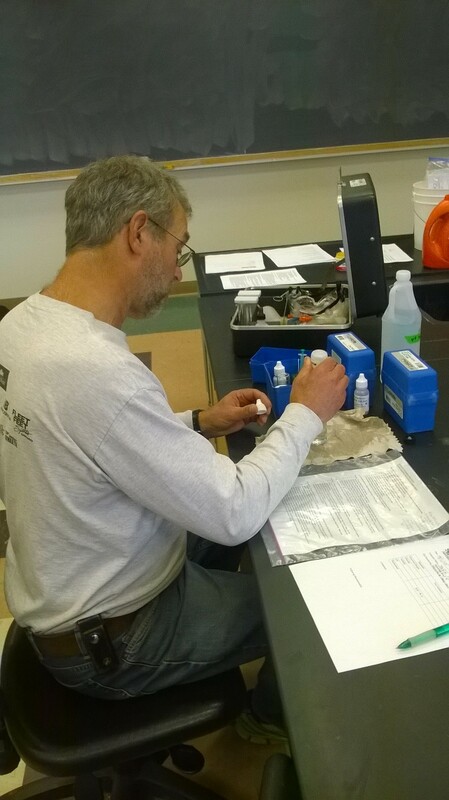 This type of monitoring, paired with the collection of basic chemistry parameters--pH, dissolved oxygen, chloride, and turbidity--has been a core strategy of our volunteer water quality monitoring program to assess baseline water quality in our local rivers and streams. 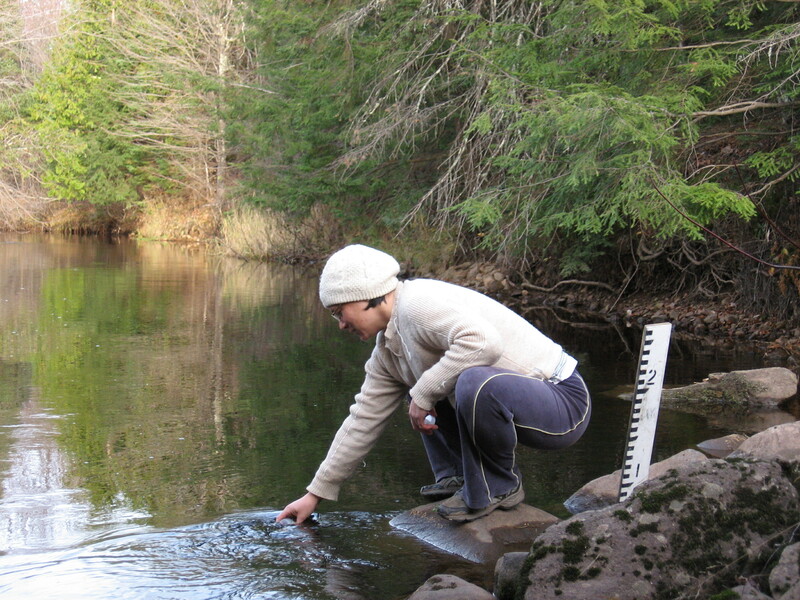 BRWA volunteers began collecting water chemistry data in 2002. 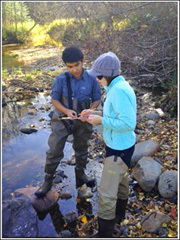 These volunteers conduct sampling once each month year-round. There are currently 30 sites being monitored by volunteers throughout our service area. Because our local citizens are donating their time and skills to help collect high-quality data, and thanks to the generous donations of our members who support the volunteer program, we all have access to an ever growing base of knowledge about our own water resources. The streams in the BRWA service area are in many ways the lifeblood of our communities, connected to our health, recreation, economies and sense of place. Our thanks for their hours and diverse talents, helping us better understand and care for the land and the waters that run through it! Save the Date for our 15th Anniversary Celebration! Add this presentation to your spring calendar! Healthy wetlands are essential to the health of our waters and wildlife. Join Tracy Hames, Executive Director of Wisconsin Wetlands Association (WWA), as he shares the vital functions wetlands play in helping maintain the health of our watersheds and wildlife. 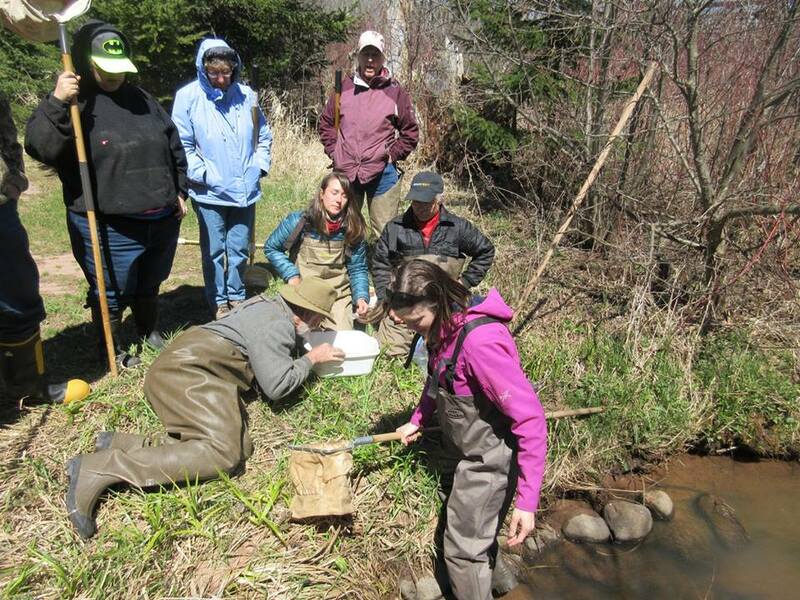 You’ll learn about the types of wetlands in northern Wisconsin and how they capture flood waters, provide habitat for fish and wildlife, and ensure that clean, cool water enters our streams, rivers and lakes. Tracy Hames became Executive Director of the Wisconsin Wetlands Association in November 2011. Tracy and the staff at WWA help individuals and communities throughout Wisconsin gain the knowledge and guidance needed to protect and care for wetlands. Tracy received a BA in Biology and Environmental Studies from Macalester College, St. Paul, MN in 1984 and an MS in Natural Resources from the University of Wisconsin - Stevens Point in 1990.